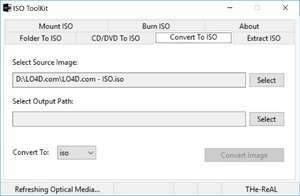 ISO Toolkit is a multi-function DVD/Blu-ray image tool which can perform several tasks including format conversion, disk mounting, copying and others. As a portable application, installing ISO Toolkit is not required. Once you do have it running, the user interface is tabbed including options for creating new images, copy image, convert image, burn image, mount image and extract image. Most of these are self-explanatory indeed. Version 7.1 is a freeware program which does not have restrictions and it's free so it doesn't cost anything. For security reasons, you should also check out the ISO Toolkit download at LO4D.com which includes virus and malware tests. Additional screenshots of this application download may be available, too.